Stevie Wonder may be reminiscing about his own childhood if he’s watching this completely adorable 6-year-old boy. Avett Ray Maness is a self-taught piano player who has been tickling the ivories since he was just 11 months old. 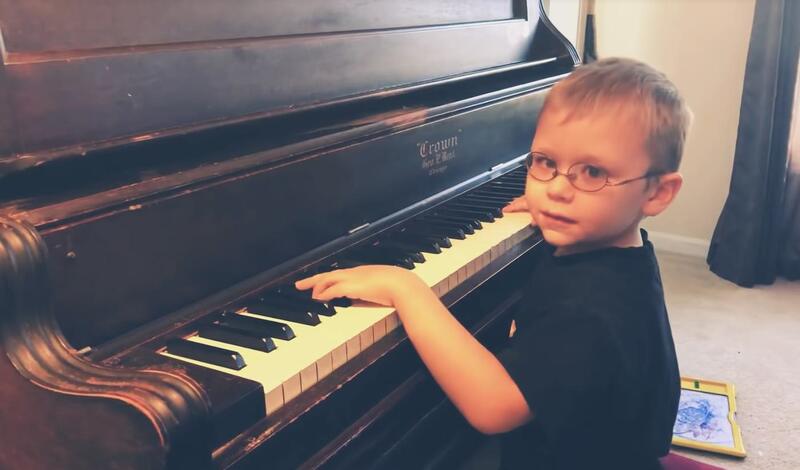 The youngster from Dayton, Ohio has become somewhat of an internet celebrity after his mom started uploading videos of his piano performances to YouTube. What’s even more impressive than his self-directed learning is the fact that he learned to play while blind. Born with optic nerve fibroplasia, Avett Ray is completely blind in one eye and has a little vision in the other. Significantly visually impaired, he walks with a cane and reads braille. Lack of plain sight has not deterred him, though, from finding his way among 88 keys. In addition to accumulating thousands of YouTube subscribers, Avett Ray has also performed on stage for hundreds of people. As of late, the youngster has enjoyed playing songs—and singing—songs by his two favorite bands: Queen and The Turtles. His mother, Sara Moore, says that she hopes her son’s talent will help to raise awareness for, and encourage people to improve, accessibility and resources for the visually impaired.